The Nexus 5 is a great smartphone in many ways ... except for that camera. After languishing with a rather lagging snapper, the Nexus 5 is finally getting a camera boost with the Android 4.4.1 KitKat update. Available over the air now, the latest Android update is geared towards fixing and enhancing the Nexus 5's picture-taking capabilities. Google's Director of Engineering for Android David Burke told The Verge that the Nexus 5 shutterbugs should expect a faster snapper overall. Burke explained that before the update, the camera would create images focused on better quality over speed. 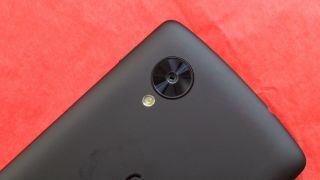 Android 4.4.1 makes it so the camera fires frames at faster shutter speeds while not relying on optical image stabilization as it does now. Post-update, the Nexus 5 camera will shoot images at faster shutter speeds, producing pictures with less motion blur. This comes with the tradeoff of more pixel noise because the camera is probably bumping up the ISO sensitivity to do this. Burke says his team has also improved the camera's autofocus, the exposure and the white balance, all aimed at enhancing image quality. On top of improving image quality, the camera app is said to launch a full second faster. Default camera app users will also notice a new progress indicator for HDR+ mode that indicates how far along processing photos are. One extra, non-camera related thing the 4.4.1 update fixes on the Nexus 5 is the face unlock bug. Currently facial recognition sometimes causes a bug that locks the camera app with a blank white screen, which requires a full device reboot to fix. 9to5Google also spotted the Android 4.4.1 KitKat update is destined for the Nexus 4 and Nexus 7 as well. Instagram is planning to hold a special event next that will help Instagramers save their memories. What could it be?